Support Israel’s Indiscriminate Bombing of the Gaza Strip, or Recognize it as Mass Murder? The ill-will felt towards the Israeli left could be gauged well among the group of right-wing protesters that the police corralled in a separate part of the plaza. They continually shouted ‘Death to the leftists’ and expressed hope that ‘a rocket from Gaza’ would kill them. In addition they merrily sang ‘WHY IS THERE NO SCHOOL IN GAZA? BECAUSE NO MORE KIDS ARE LEFT.’ [emphasis mine] Some protesters tried to convince this group to stop singing these songs as they were detrimental to the message of support for the IDF that they were trying to promote, but to no avail. 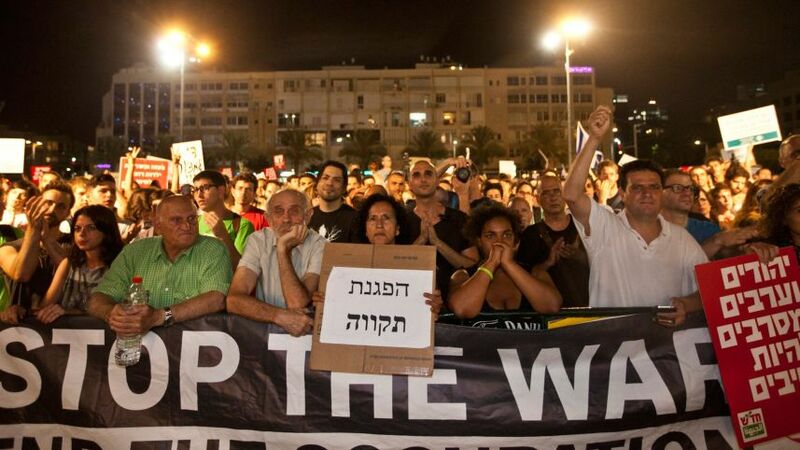 Israelis in Tel Aviv 26.7.2014: “There’s no school tomorrow,there’s no children left in Gaza! Oleh! Melissa M.: Really? IDFs mass murder? Their people wouldn’t be getting killed if they weren’t operating out of their homes and in front of their citizens. What is Israel supposed to do? If they see they are being targeted from a civilians home they need to take the home out. Of course it’s a no win for anyone but Hamas is giving Israel no choice. Genaire: Israel is suppose to not keep these people in an open air prison. Israel is suppose to stop illegally expanding its borders into Palestinian territory.Israel is suppose to either give these people the right to take part in their government our release them from occupation (that has lasted 40+ years). Israel suppose to not intentionally target journalists offices. Israel is suppose to not intentionally target schools. Israel is suppose to not intentionally target UN facilities. Israel is suppose to not target children playing on the beach.Israel is suppose to not be a state based on an apartheid system. Should I go on? Rayn: Yes. Really, Melissa. I consider the actions of the IDF to be mass murder, as well as a Crimes Against Humanity (or a War Crime, if you’re willing to qualify the Israeli government’s attack against the civilians of Gaza as a “war”). To blame Hamas for the massacre of Gazan civilians is a flawed exercise in causality. Since IDF forces are the ones pulling the triggers of their weapons, and executing trial-free death warrants on the hundreds upon hundreds of innocent, unaffiliated civilians of Gaza, all in pursuit of Hamas – terrorizing men, women and children, alike, in the process – truly, these victims “wouldn’t be getting killed if ” Israel’s government would simply refuse to indiscriminately murder them, and finally reject the immoral claim that such criminal activity EVER qualifies as a “right,” or as “self-defense,” since such logic is, indeed, EXACTLY the IDEOLOGY of a TERRORIST!!! What Israel is “supposed to do” is RESPECT HUMAN RIGHTS! They absolutely have a “choice,” and have chosen the COWARD’S ROUTE! Melissa M.: I’m not into debating we agree to disagree . just was wondering what exactly u thought israel was supposed to do when they were getting bombarded with Rockets. I do see it as self defense, u don’t that’s fine. It’s America we are all free to have an opinion. Genaire: They’ll go in to steal these people homes, but choose to indiscriminately launch missiles into heavily populated areas. If you want a complete and total genocide and steal these people’s land what better way then through long range missile attack, while closing their borders preventing escape. Melissa M.: But if they didnt respond don’t u think Israel would be in great danger? Genaire: Not a single Israeli citizen has been killed by Hamas’s rockets. They place themselves in danger with the illegal land grab that has taken place (against international law). “Statists (much like the terrorists they spawn, fund, then war with) love collectivism, man-made borders, violence and the institutionalization of ritualistic human sacrifice. And, though I still find it repulsive, I am barely surprised anymore when a Statist uses one of my FB peace-posts to proudly declare to the world that these things, alone, are legitimate enough causes for their legions to commit mass murder against innocent civilians they’ve never even met, for decades at a time! Statism does not concern itself with justice and morality, because these things would only hinder the control and power over human beings it is really after. And, at the same time, the State refuses to fully acknowledge Individuality because it simply isn’t convenient to its rapidly-expanding meat-grinder control-grid. Individuality only serves as evidence that it is illegitimate for the State to invoke such final, death-penalty punishments against groups of innocent humans without even providing any direct evidence of the alleged crimes being committed by each member! Statism is just another tool of oppression, in the arsenal of the Accuser! Sadly, these numbers reveal that the world’s “Most Moral Army” has snuffed out the lives of more children than it has killed Hamas “militants” in its latest war-criminal adventures inside Gaza! Gazan youths represent one fifth of the Israeli governments total killings, and almost one third of their total civilian murder victims! Finally, considering the dubious relationship between Israel and Hamas, murdered Gazan civilians seems to be a major goal for BOTH parties, with over 1.5 million innocent Gazan refugees trapped in the middle, to be sacrificed as political pawns! Melissa M.: I can link a bunch of websites that support my opinion also but I won’t Bc like I said dont like to debate it’s just back and forth on what each other believes again I agree to disagree. By saying that I am not saying to be silent do as you please it’s your fb account. I was curious in your post that’s all. Rayn: That’s all well and good, but opinions do not trump the Truth. It is ALWAYS wrong to murder the innocent. This is not a conditional statement. There are no exceptions. There are no exemptions. These disingenuous claims by Israel’s government, and its supporters, for the right to “Self-defense” against the CIVILIANS OF GAZA in pursuit of HAMAS are PATENTLY FALSE, because the civilians of Gaza are an INNOCENT PARTY, having COMMITTED NO AGGRESSION against Israelis, whatsoever! Tagged apartheid, Arabs, crimes against humanity, Gaza Strip, Hamas, Israel, occupation, Palestinians, terrorism, war crimes. Bookmark the permalink.